“Railroad Bill” is a blues ballad that dates to the 19th century and has been performed and recorded by many folk artists throughout the 20th century. People have conjectured that the subject of the song is an African American outlaw named Morris Slater who robbed freight trains in the 1890s. Slater’s nickname was Railroad Bill. Only a few of the song’s dozens of stanzas seem to refer specifically to Slater’s activities. The majority of the stanzas are quite general. Was “Railroad Bill” written about Slater? Or did Slater get his nickname from what was a preexisting song, with the verses specific to him being added later? Stories about Morris Slater began to surface in newspapers in 1895. Slater robbed freight trains, primarily in Alabama and western Florida along the Louisville & Nashville Railroad line. His method was to throw merchandise off moving railroad cars and pick it up later. Slater allegedly killed at least two sheriffs as they, and a succession of detectives and railroad officers, tried to apprehend him. He was shot to death in Tidmore and Ward’s General Store in Atmore, Alabama, by Constable McGowan and storekeeper Bob Johns on March 7, 1897. That Slater could be viewed as a hero and a martyr is not surprising, considering the racial and economic divide in the post-Reconstruction Deep South. The song “Railroad Bill” seems to be related to other 19th century songs of African American origin about characters named Bill, including “Roscoe Bill,” “Shootin’ Bill,” and “Buffalo Bill.” Some lyrics are shared among these songs. This type of common “floating” stanza is a characteristic of blues ballads and other types of folk songs. The first lyrics to “Railroad Bill” were collected by folklorists in Mississippi and Alabama during the first two decades of the 20th century. Newman I. White reported three fragments of lyrics he collected from a construction gang in Mississippi in 1906. Howard Odum published three longer texts in his 1911 Journal of American Folklore article “Folk-Song and Folk-Poetry as Found in the Secular Songs of the Southern Negroes.” One has no identifiable references to Slater, and one seems to be mostly about him. The following stanza collected by Odum is very similar to stanzas found in other 19th century Bill songs. Only four or five of the dozens of “Railroad Bill” stanzas collected and recorded make definite reference to Slater’s activities. 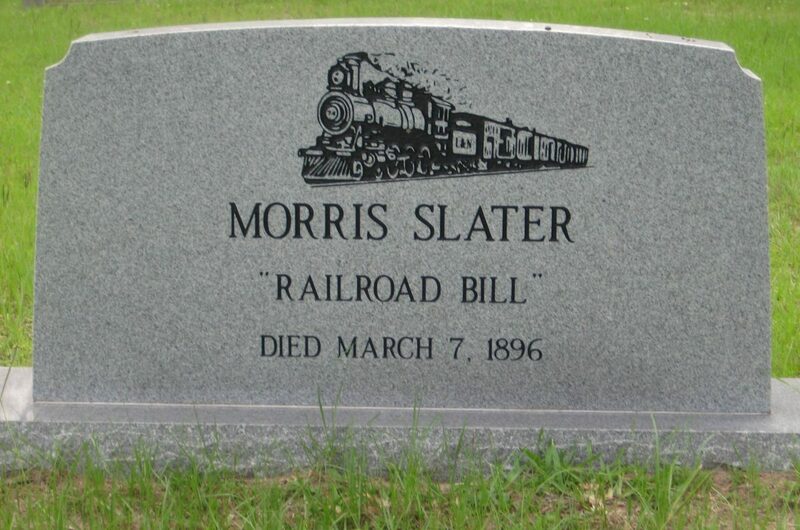 Especially considering the oddity of a man named Morris Slater being nicknamed Railroad Bill, it is entirely likely that Slater was given the nickname as a reference to a preexisting song or songs. The few verses that specifically reference Slater’s activities may have been added later. As with many traditional folk songs, the origins of “Railroad Bill” may never be revealed. The first recording of “Railroad Bill” was made by Riley Puckett and Gid Tanner on September 11, 1924. 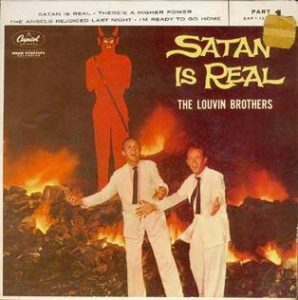 Two months later, Roba Stanley and Bill Patterson recorded it. Stanley took out the first copyright on the song, claiming credit for the words and music. Three recordings of the song were made in 1929, including the first by an African American artist, Will Bennett. 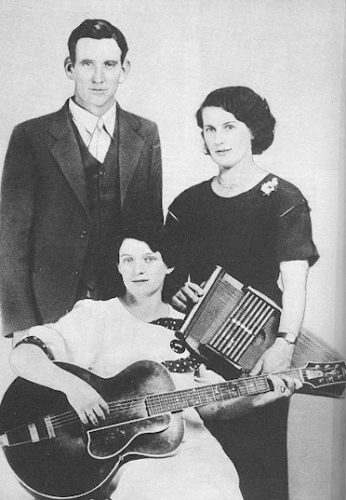 Frank Hutchison’s 1929 recording appears to be the first one that was played in fingerpicking style on the guitar. It’s also the first with the distinctive Major III chord following the I chord behind the second line of the verse. Both of these attributes became standard in many subsequent versions of the song. Recordings of “Railroad Bill” are available from many other artists, including Joan Baez, Jerry Garcia, Ramblin’ Jack Elliott, Hobart Smith, Lonnie Donegan, Crooked Still, Van Morrison, Etta Baker, and Billy Bragg. Dozens of different stanzas of “Railroad Bill” have appeared in print and on recordings. Below are the complete lyrics from the recordings of Will Bennett and Frank Hutchison. Cohen, Norm, and David Cohen. Long Steel Rail: The Railroad in American Folksong. Urbana: University of Illinois Press, 2000. “Railroad Bill.” Encyclopedia of Alabama. 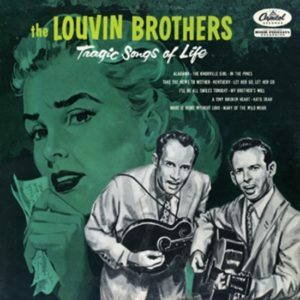 “Railroad Bill [Laws I13].” Traditional Ballad Index. This is post 4 of 5 in the series Anthology of American Folk Music. 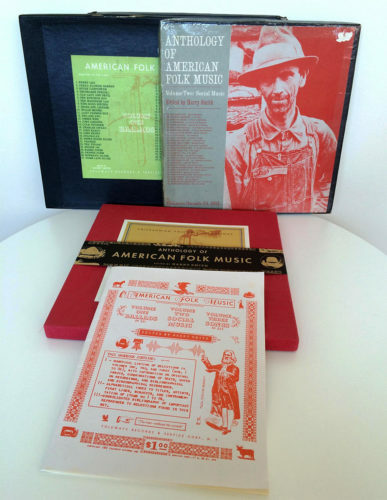 Anthology of American Folk Music has inspired countless musicians and songwriters, including Bob Dylan, Elvis Costello, Jeff Tweedy, Jerry Garcia, John Sebastian, and The Fugs. 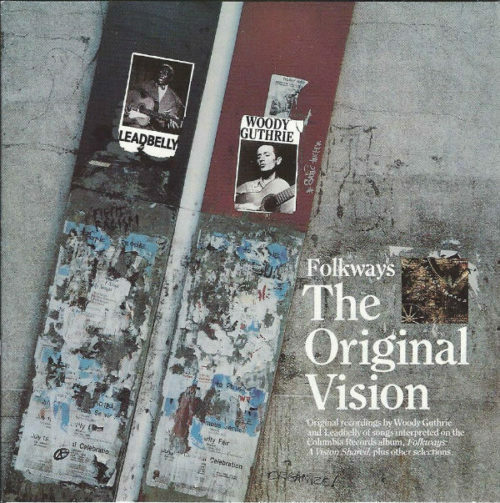 Folkways Records released the Anthology on six long-playing records in 1952, and Smithsonian Folkways Recordings re-released it on compact disc in 1997. It consists of three volumes, each containing two discs: Ballads, Social Music, and Songs. 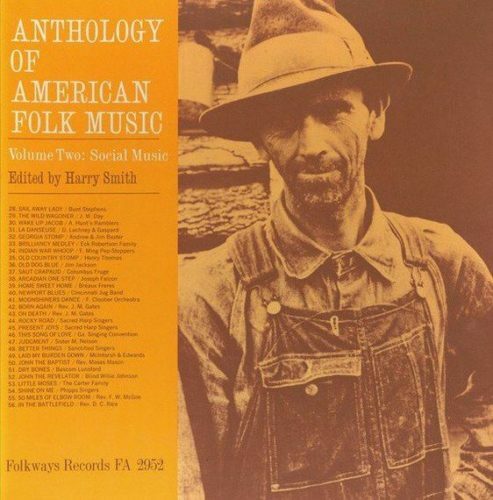 This post explores Anthology of American Folk Music Volume Two – Social Music. Social Music focuses on music as a part of community events, specifically dance and worship. The first fourteen tracks include various forms of dance music, and the remaining fifteen songs are church and religious music. The first track on Anthology of American Folk Music Volume Two – Social Music is a 1926 unaccompanied violin recording of “Sail Away Lady” by “Uncle Bunt” Stephens. Harry Smith, editor of the Anthology, notes that the style of this performance is probably typical of American dance music between the American Revolution and the Civil War. Early European settlers generally used unaccompanied violin for dancing. The lining hymns are followed two shape note songs from The Sacred Harp song book, first published in 1844. Shape note singing originated in New England and was perpetuated in the American South. Shape note songbooks represent the notes of the melody with different shapes to identify the appropriate pitch. The method was devised so people who don’t read standard musical notation can join the singing. In the first part of the song, instead of the lyrics, singers sing the name of the scale position – fa, sol, la, or mi. Other unaccompanied vocal performances follow in addition to some with instrumental accompaniment. Blind Willie Johnson recorded “John the Revelator” in 1930. Johnson made some of the most popular African American religious song recordings of the time. Social Music concludes with Rev. D.C. Rice and His Sanctified Congregation’s notably contemporary, jazz-inflected performance of “I’m in the Battle Field for My Lord” from 1929. 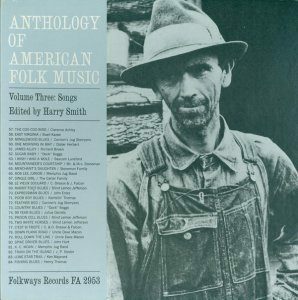 The following Spotify playlist is a close approximation of Anthology of American Folk Music Volume Two – Social Music. The actual Anthology is not on Spotify. Most of the tracks on this playlist are the same recordings in the same order but from different sources. You should purchase the real deal on compact disc or record to get all the essays and annotations. This is post 3 of 5 in the series Anthology of American Folk Music. The popularity of Americana and roots music today can, in no small measure, be credited to Anthology of American Folk Music. 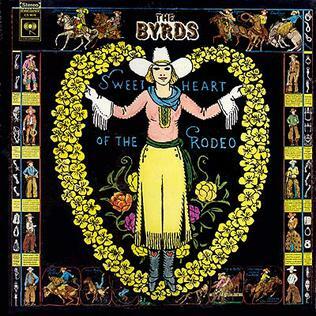 Writer Greil Marcus called the Anthology “the founding document of the American folk revival.” It was released by Folkways Records on six long-playing records in 1952 and re-released on compact disc by Smithsonian Folkways Recordings in 1997. The Anthology consists of three volumes, each containing two discs: Ballads, Social Music, and Songs. This post explores Anthology of American Folk Music Volume One – Ballads. Ballads are narrative, or storytelling, songs. It’s impossible to determine exactly how long humans have been telling and singing stories. The ballad tradition as we know it today is traceable to the minstrels and troubadours who traveled and entertained throughout most of Europe during the Middle Ages. A repertoire of common ballads evolved in the British Isles from the 15th through the 18th century. While most may have originated from single composers, who are unknown to us today, these ballads evolved and developed variants over time through the singing of many different people. The old British ballads tell stories of nobility, romance, love, family strife, heroes, monsters, ghosts, death, and damsels in distress. Many of these ballads were carried in the hearts and minds of immigrants to Colonial America. They were commonly sung in America and passed down to subsequent generations orally. By the early 19th century, Americans were composing new ballads to tell stories relevant to their lives in the United States. Harry Smith, the creative force who almost single-handedly assembled the Anthology, starts volume one with a series of five Old World ballads that can be found in Francis James Child’s seminal work The English and Scottish Popular Ballads. The books, published in five volumes between 1882 and 1898, catalog the texts of 305 distinct ballads and 1,660 variants. Most of the Child ballads, as they are now commonly called, originated and circulated orally in the British Isles during the 17th and 18th centuries, though some have remnants and influences that can be traced as far back as the 13th century. The Child ballads are the cornerstone of the Anglo-American ballad tradition. In North America, the Child ballads went where the British settlers went and have most frequently been found and collected in the Appalachian and Ozark Mountains, New England, the southern coastal states, and the Canadian maritime provinces. Originally sung unaccompanied, by the 1920s and 1930s when the recordings on the Anthology were made, they were often sung with instrumental accompaniment that might include guitar, banjo, fiddle, dulcimer, or any combination of these and other instruments in a small string band. 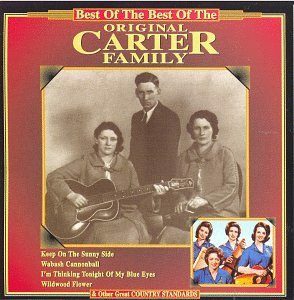 The Anthology includes Child Ballad #243, “The House Carpenter,” recorded in 1930 by singer and clawhammer banjo player Clarence Ashley. All versions listed by Child are of Scottish origin, though details of the story differ. Ashley is from Shouns in East Tennessee and sang with medicine shows in the 1920s and 1930s. He is one of several Anthology artists who had a second career performing and recording music in the 1960s after being rediscovered by young folk revivalists, who had initially assumed all the artists from the Anthology had long since passed. 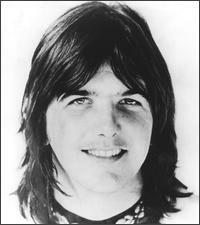 Ashley was only 35 years old when he recorded “The House Carpenter,” though he sounds as though he might have been 135. Heavily influenced by the music of the Anthology, Bob Dylan recorded “The House Carpenter” during the November 1961 recording sessions that produced his first album. This recording was not included on the Bob Dylan album, which consisted almost entirely of traditional folk songs. His recording of “The House Carpenter” was eventually released as part of The Bootleg Series Volumes 1 – 3, issued in 1991. Following the five Child ballads, the Anthology moves into indigenous ballads that were born in the United States during the 19th and early 20th centuries. They generally recount actual events and were composed soon after the events occurred. Indigenous ballads, like British ballads, are often of unknown origin and developed many variants through the singing of people who transmitted them orally over the years. They tell stories of crime, love, natural disasters, and change brought about by the industrial revolution. On the Anthology, the songs aren’t sequenced chronologically, which would have been all but impossible. Part of Harry Smith’s genius is evident in the way the songs fit together, following sometimes intangible thematic, lyrical, or harmonic threads. “Kassie Jones” recounts events related to an actual train wreck that occurred on April 30, 1900, killing engineer John Luther Jones. 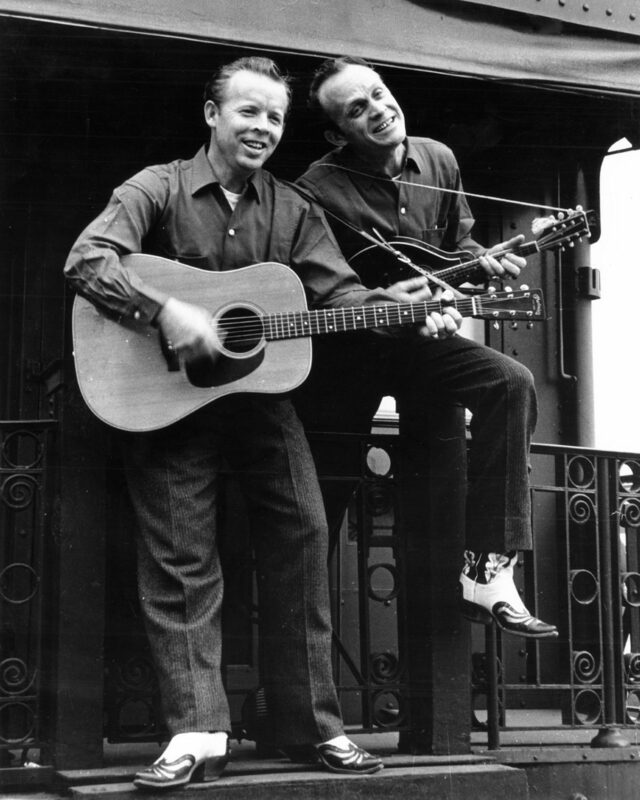 Jones was from the town of Cayce, Kentucky, which is how he attained his nickname, usually spelled “Casey.” The song was written by Wallace Saunders, a close friend of Jones, a few days after the wreck. It might more accurately be identified as a blues ballad, because it does not strictly follow the events of the story, as ballads generally do. The version of “Kassie Jones” on the Anthology was recorded by Memphis bluesman Walter “Furry” Lewis on August 28, 1928. Like Ashley, Lewis had a second career in music later in life after being rediscovered during the folk music revival by disciples of the Anthology. The first video below is Lewis’ recording of “Kassie Jones” from the Anthology, followed by a video of him performing it in 1968. Joni Mitchell wrote “Furry Sings the Blues,” after meeting the singer in a Memphis boarding house in the 1970s. “The House Carpenter” and “Kassie Jones” are just two of the twenty-seven ballads on volume one of the Anthology. The following Spotify playlist is a close approximation of Anthology of American Folk Music Volume One – Ballads. The actual Anthology is not on Spotify. Most of the tracks on this playlist are the same recordings in the same order but from different sources. You should purchase the real deal on compact disc or record to get all the essays and annotations.